One morning, Wataru Hoshino found a sleeping girl - in nothing but her underwear - in his room. When she woke up, she quickly escaped by jumping out of the window, but not without punching Wataru in the face first. This girl, Rinna Sawaki, ends up being a transfer student of Wataru's school, as well as the new roommate of Wataru's dormitory. Wataru lives with four other girls and their school teacher, but due to Temizugawa Heavy Industry's cancellation of their aviation branch - South Sakojima Island's major company - the families involved with the corporation have to be evacuated in one year. As a result of this, the four girls have to leave the island in one year's time. Knowing this, Rinna refuses to become friends with Wataru and the other girls, because of the pain that she might experience as a result of their eventual separation. However, Wataru disagrees with her, and over the course of the year, tries to convince her otherwise. 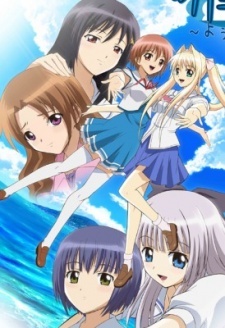 Watch Kono Aozora ni Yakusoku wo Episodes Online at Animegg.org. Kono Aozora ni Yakusoku wo is available in High Definition only through Animegg.org. Choose an episode below and start watching Kono Aozora ni Yakusoku wo in Subbed & Dubbed HD now.